The Murray Family is another confirmation of why i absolutely love what i do! Chrissy emailed me a little over a month ago, and we connected right away and i couldn't WAIT until this shoot! She came up with some fantastic ideas and it all went smoothly! 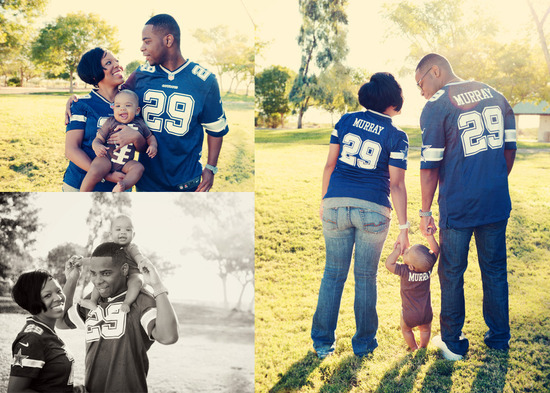 Shante and Chrissy are some fans of the Cowboys... so we started with jerseys! and a little Eli football of course and then on to bubbles and including their cute puppy too! i could go on and on about this amazing family. One reason Chrissy and i connected was because of our shared faith, and it's always so encouraging to meet a believer. Instantly with her, they were no longer a client, but someone i feel close to! so our meet up for photo exchange might have to be a coffee date or something! bummer! ;) so here's a few photographs from our time together! i shared this image on fb ealier, but i just can't take credit for the love here. Shante squeezed his beautiful family, and i like to think Eli was squeezing so tight too that his cute face squished! i'm so thankful i was able to photograph your family! i am still amazed at how good Eli did! when he was done with photos he didn't cry, it was just sleepy time. you have such a lovely family, and it encouraged my whole week. Your family has such a calmness and love you make others feel when they're around you.